My sister Karen asked me to make some fire engines to sell at an upcoming charity auction to raise money for a new fire house. 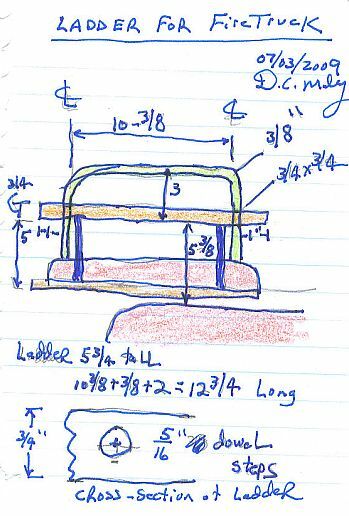 I searched Google's warehouse and found an existing Sketchup plan for a neat looking wood fire engine. It was done by Ron Fritz who has a web site with many plans. 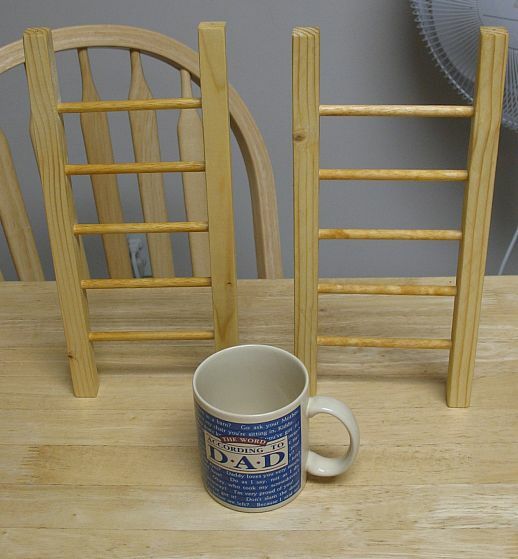 Making the little ladders was a challenge. I sawed out the 1/4 x 1/4 inch sides from a larger piece on the table saw. I sawed the 1/8" dowel rungs on the scroll saw. I made the rungs too long on purpose, then sanded them flush with the belt sander. This fire engine design has at least 33 pieces, so it takes a while to cut the pieces and build it. I bought the spoked wheels and the headlights. The spoked wheels were confusing. I wanted 1/4" axles and online description said 1/4".....but when I got them there were 2 different diameters, 1/8 and 1/4....to fit axle pegs with 1/8" diameter and 1/4" head. I just drilled out the axle hole to 1/4" on the drill press. 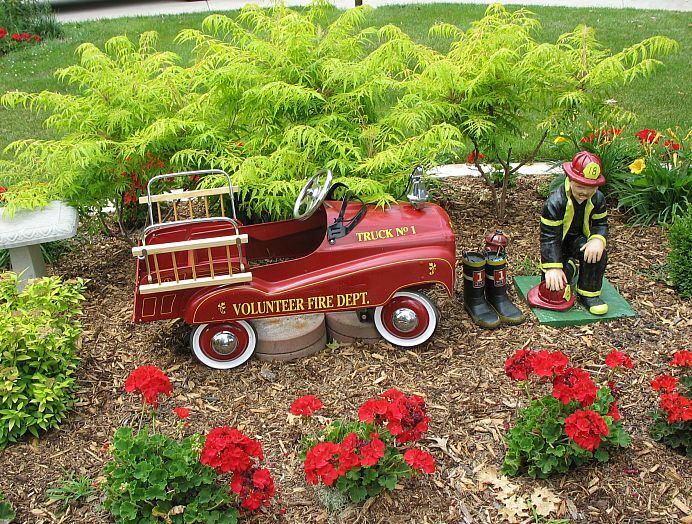 The finished fire engines are cute and my compliments to the designer. My sister Karen wanted me to build some larger fire engines for the charity auction. I doubled the scale in Sketchup and built 2 larger fire engines. They were about 20 inches long. At the new firehouse charity auction, a small fire engine sold for $20 and a large fire engine sold for $40. It will be interesting to see how the pine ladders with linseed oil hold up over the summers to come. On the small fire engines, I always wanted to letter "Fairbury Fire Dept." on them, but did not know how to make such small letters. I found that Hobby Lobby has fine point paint pens that can permanently mark wood. I tried the black fine-point paint pens on one of the little fire engines, and it worked great!! 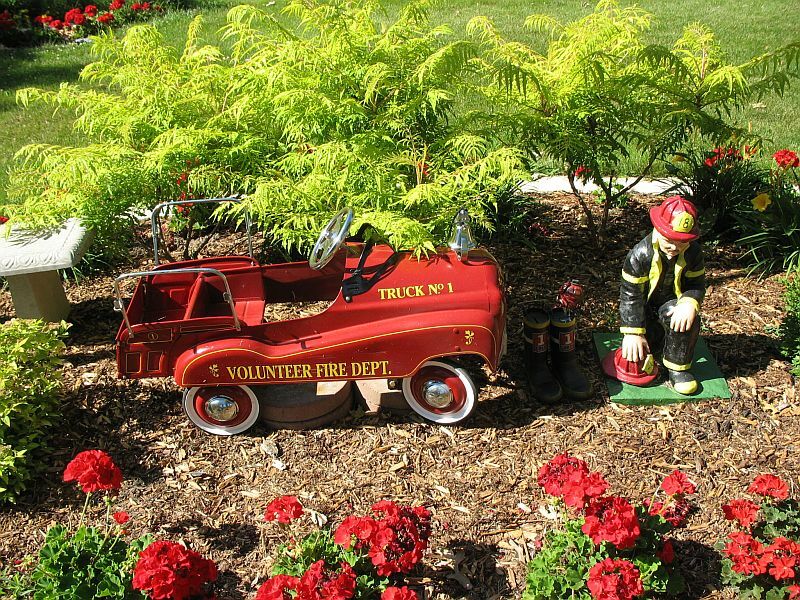 There are at least 33 pieces in each fire truck, so it takes a while to make them. The paint pens allow you to letter them using relatively small letters.